Rep. Debbie Wasserman Schultz (D., Fla.) announced Friday she would not attend the Women's March in Washington, D.C. because of anti-Semitism and bigotry at the organization's highest levels. In an op-ed published by USA Today, Wasserman Schultz gave the Women's March leadership its most high-profile condemnation to date, singling out Carmen Perez, Linda Sarsour, and Tamika Mallory by name. Wasserman Schultz, who is Jewish, raised alarm at the march leaders' unrepentant defense of anti-Semitic comments and organizations. She pointed to their ties to the Nation of Islam (NOI) and its leader, Louis Farrakhan. Farrakhan is a well-documented bigot, having made deeply misogynistic, homophobic, and anti-Semitic comments. The Anti-Defamation League describes NOI as having "a consistent record of anti-Semitism" since the 1930s. Farrakhan called Jews "termites" earlier this month, and he has called Adolf Hitler a "great man." Sarsour has maintained ties to Farrakhan. She also has ties to unindicted terror co-conspirators and publicly expressed a wish to "take away" the vaginas of insufficiently progressive women. She has repeatedly declined to condemn the NOI leader. Mallory's attended an NOI event at which Farrakhan made some of widely condemned comments. Nevertheless, she called Farrakhan the "GOAT" (greatest of all time), and defended him on multiple occasions. Mallory was asked about her endorsement of the hate preacher this week and again refused to condemn him. Wasserman Schultz lambasted her for only "taking issue with the words he chose and the fact that Minister Farrakhan is male, rather than acknowledging the hurtfulness of his rhetoric toward Jews and the LGBTQ community." Wasserman Schultz further took umbrage with Sarsour claiming Jewish women were insufficiently loyal to the progressive cause because of their support for Israel. Sarsour has said they "masquerade as progressives but always choose their allegiance to Israel over their commitment to democracy and free speech." Accusations that the Women's March has fostered hate mounted to the point where its leaders stopped calling them part of a right-wing smear campaign, and they tried to calm the roiling anger within its own ranks. They eventually attempted an apology, expressing regret for not denying the accusations sooner. They did not admit to the accusations themselves, and Sarsour expressed annoyance the same week over being forced to condemn Farrakhan, saying having to answer for the conduct of other Muslims was a feature of "white supremacy." 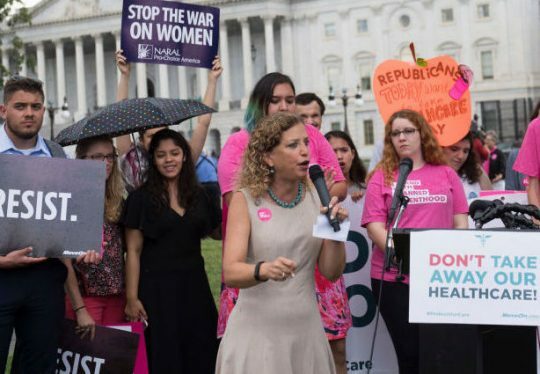 Wasserman Schultz, like others, does not consider the march leaders' defense to be sufficient. "It should not be this difficult to condemn hate speech," she said. "I cannot walk shoulder to shoulder with leaders who lock arms with outspoken peddlers of hate. Wasserman Schultz credited others who had already given up on the Women's March. "I am not alone," she said. She noted that the Southern Poverty Law Center, EMILY’s List and the Democratic National Committee were no longer sponsors. Teresa Shook, who actually founded the march after Trump's election with a Facebook post and event, has left the organization, accusing the leadership of allowing "anti-Semitism, anti-LBGTQIA sentiment and hateful, racist rhetoric to become a part of the platform." Wasserman Schultz noted that some local marches around the United States have explicitly challenged Sarsour, Mallory, and the march's hate. She called on Americans to support those events. "I will join a movement of women around the nation who are participating in local marches that have distanced themselves from those national Women’s March leaders who still ally with bigotry," she said. She mentioned local chapters in Florida, Washington state, New Orleans and Cleveland as having either publicly decried anti-Semitism or canceled their march in response to the national leaders' conduct. Not all prominent elected officials have broken from the Women's March, nor have all chapters disassociated from the national movement. Sen. Kirsten Gillibrand (D., N.Y.), who recently annoucened her plans to run for president in 2020, is the keynote speaker Saturday at the Women's March in Des Moines, Iowa. The Iowa event is directly affiliated with the national Women's March. Wasserman Schultz was among the prominent lawmakers to attend the march in Washington, D.C. two years ago. At the time, she described feeling "absolutely electrified by the promise of what a movement built around sisterhood and solidarity could accomplish." Now, "faced with two choices, staying silent while refusing to join the national march, or speaking out," she is speaking out. "We must fight oppression and bigotry in all its forms. Otherwise, what — or who — are we marching for?" she concluded. This entry was posted in Issues, Politics and tagged Anti-Semitism, Debbie Wasserman Schultz, Linda Sarsour, Women's March. Bookmark the permalink.